The above date marks the sad passing of one of the Museum’s tiniest volunteers: In early February I discovered Beetah, my Carabus violaceous lying still on her coconut substrate, and to be honest, a little dried out. My little pet worked hard in life to inspire the public with entomological wonder of what living gems can be found in local parks, let alone the wider world, so I think it’s only fair to take time and reflect on her life and service upon her passing. 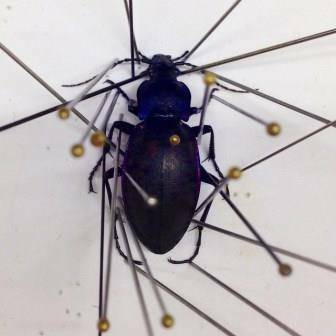 Obituary: This Carabus violaceus specimen was collected live while Hillery Warner was taking a walk in Nonsuch Park with her 1 ½ year old son, Dominic on 29/08/2013. 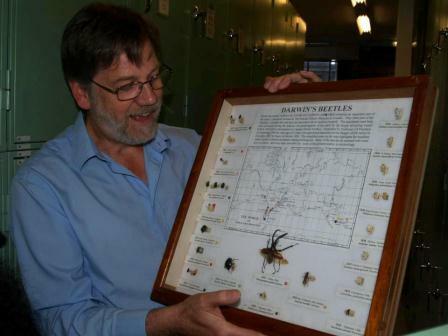 Dominic christened the specimen "Beetah" on the spot and it was kept as a family pet until its death of natural causes in early 2015, at which point it was brought to the Museum to join the collections on 11/02/2015. Beetah led a lavish life for a ground beetle, feasting on fish cakes and the finest chunks and jelly from packets of cat food. She apparently reproduced while in captivity and two of her offspring are also in the collection. While not an official front of house Museum employee, Beetah wore her public-engagement-purple elytral margins with pride, inspiring visitors at Science Uncovered 2013 and 2014. She also acted as an entomological ambassador during National Insect Week, 2014 where she met artists and UK celebrity Jonathan Ross. 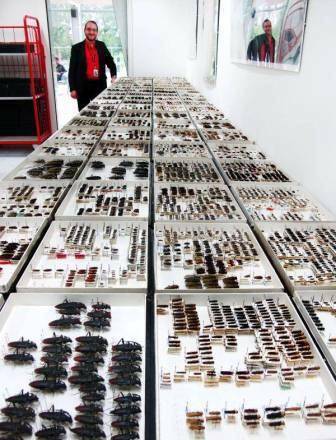 While the lights have left the multifaceted ommatidia of her compound eyes, she may yet "see" another Science Uncovered as she continues her service to the Museum in death as she did in life, entering her new role as museum specimen. 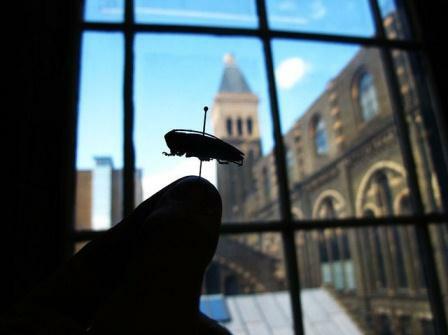 I found my beetle back in 2013 in a park near my home while walking with my then 1 ½ year old son. 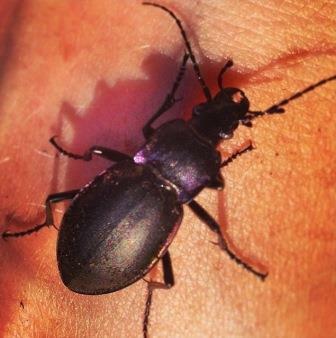 As I keenly showed my son this lovely large black beetle with iridescent purple pronotal and elytral margins, he enthusiastically named it ‘Beetah’ and I detected some bonding going on, so I decided Beetah would live with us as a pet. I initially added a snail or two to her tank but soon discovered she was much happier to dine on my husband’s fish cakes. In fact, she ate so much fish cake that I noticed not long after that single meal that she had plumped up so much that her plural suture stretched enough that the underlying membrane was showing. I thought she was just fat. Some time later there were a number, (at least 5), carabid larvae running around the tank (I’m sorry I called you fat, Beetah). 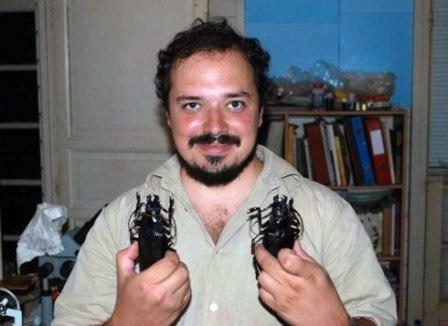 How did this happen with just one beetle? In short, it didn’t, but insect reproduction is amazing and entomologists never pass up an opportunity to talk a bit about genitalia! The christening of “Beetah”: Almost as good as the whole Mofasa/baboon/Simba thing from that ’90’s movie. 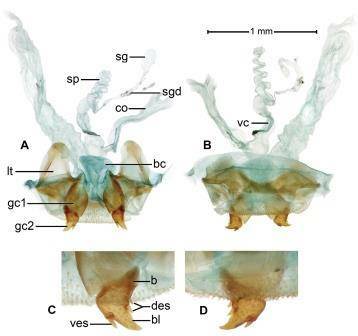 Internal female genital structures of carabid species Badister amazonus (Erwin & Ball, 2011). Female insects have an internal genital structure called a spermatheca. Upon mating, sperm is stored in the spermatheca rather than going straight to the eggs for fertilization. The release of sperm from the spermatheca is under hormonal control and so the female can wait until conditions are ideal for reproduction before releasing the sperm from this structure to fertilize her eggs. This could mean waiting to find a suitable insect host for a parasitoid wasp, or finding enough fish cake to suitably supply the eggs with nourishment for pet Beetahs'. Lady insects have quite a lot of control over this and scientists have reported carabids going for as long as 10 months without contact with males before ovipositing (Gilgado & Ortuño, 2012) and honey bees can store sperm for over 3 years (Gullan & Cranston, 2000). While both mother and larvae enjoyed cat food, I noticed that the larvae were active and fed during the day while mum was nocturnal. (I often described having a pet carabid like having a 6-legged carnivorous hamster due to the audible night time scrabbling sounds coming from her tank). This division of activity surely reduces the likelihood of intraspecific predation in nature. (Metamorphosis is a generally fantastic strategy to reduce intraspecific competition). I won’t comment on what happened to the larvae. Truthfully, I don’t know for sure (ref. 1). I’ll just let the mystery be. Not long after that exciting event, Beetah began her work as and Museum volunteer. 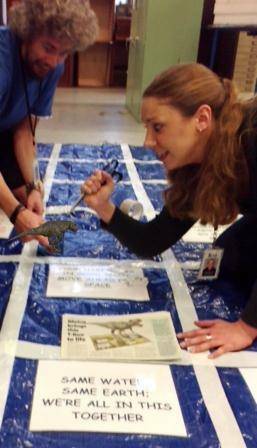 Her first public outreach event was Science Uncovered, 2013 where she assisted Dr. Eggleton and Dr. Inward in delighting the public with the wonders of soil associated invertebrates. 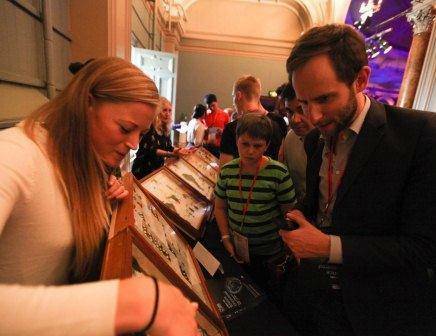 In 2014 she participated in both a second Science Uncovered and National Insect Week activities where she met artists and an English television and radio presenter named Jonathan Ross, among other visitors. I did rather wonder if she might make it to a third Science Uncovered (alive) but alas, she saw her last sunsets in early 2015. So what did I do with the husk of my fallen friend? Put the kettle on for her, of course. 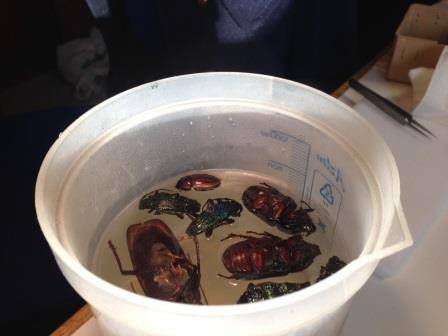 One of the quickest ways to get a desiccated beetle specimen relaxed for mounting is to pop it into warm water (ref. 2.) So after a few minutes of steeping a Beetah tea, I pulled her out of the hot water, wrapped her in moist tissue, and took her to work. Steeping beetle tea prior to mounting. 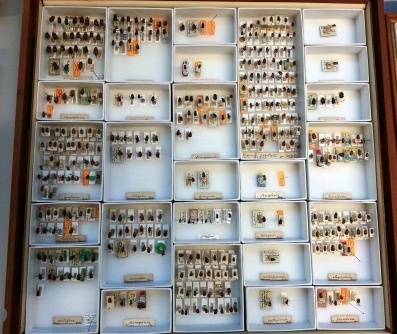 These are Rothschild bequest beetles I prepared from our dried accession material. Beetah all set on her mounting board. 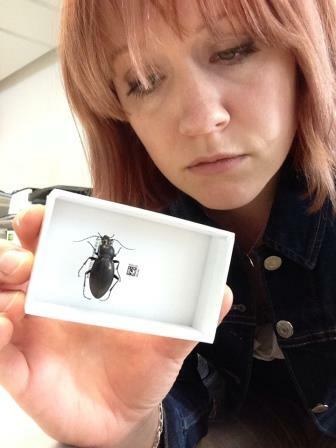 Once at the Museum, I pinned and set Beetah with extra-special care - after all, a Beetah’s work doesn’t finish just because haemolymph stops pumping through her dorsal vessel (or “heart”- but insect circulatory systems are very different to vertebrates’. See ‘Insect Circulation in Short, below). Oh no, I fully expect her to continue public outreach duties long after death- no rest for the dead in entomology! Normally, I would tuck a specimen’s antennae a bit closer to its body to make them less vulnerable to breakage and save them best for taxonomic preservation and study, but Beetah is a common species, already identified and described long ago so setting her for a really attractive dorsal habitus with no limb overlap won out over supreme specimen protection. Once set out nicely and (re)dried, it was time to label her up and database her. We here at the Museum hope to digitize our entire collection. With 80 million objects, this is no small ask so we’re coming up with snazzy ways to do this as efficiently as possible, but Beetah, being a single and super special specimen, I entered into our digital catalogue individually, manually, myself. Her unique identifier is now and forever 1681080. The data matrix attached to her pin jutting out clearly visible from above can be read by computers and smart phones to quickly access all her collection information. The details of where and when she was collected are now digitally stored along with her species determination, (obituary), and where she’s kept in our cavernous labyrinth of cabinets so she can be easily retrieved for, oh, I don’t know maybe I will make her make an appearance for her third Science Uncovered in September…. P.S.- If my son asks any of you where Beetah is… she’s at the Museum. Just leave it at that. Insect Circulation in Short: One of the more basic zoological divisions in the animal kingdom is that of deuterostomes vs. protostomes. These terms roughly translate to “second mouth” vs. “first mouth”. When the first divot forms in the blob of cells that eventually grows into an animal, it is destined to either become a mouth, or a bottom. Our cell-blob-divot becomes an used-food exit route, so we’re deuterostomes. Insects’ divot becomes a mouth. So right from the start insects couldn’t be much more different to us. A rather useless diagram showing the end destination for the blastopore in both protostome and deuterostome blastocysts. Other equally fundamental differences in development mean that while our nerve chord is in our back, insects’ are in their chests. Our heart is in our chest. 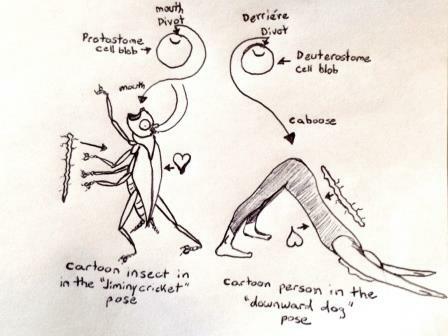 Insects’ “hearts” are in their backs. But the location of an insect heart isn’t the only huge difference to our circulatory system. Our blood carries nutrients and oxygen to cells, but insect blood only carries nutrients. Our blood is closed into veins, arteries, and capillaries. Insect blood washes more or less freely around the body cavity. The insect “heart” is basically a tube with muscles and valves that takes in haemolymph from around the midgut of an insect where nutrients from digested food diffuses into the “blood” and then pumps it into the head where it’s released to freely wash over the all-important primary ganglion (brain) and then wishily washily work its way back to the tail end of the insect; feeding cells and picking up waste on its way. Desiccated- Dried up. Because scientists decided one word with 4 syllables is more efficient communication than two one-syllable words. Dorsal habitus- The view normal to the lateral plane of the animals’ body. Whatever that means. Elytral- Of the elytra, which are the hard forewings of a beetle. Haemolymph- Insect blood. It’s not Haemoglobin because it doesn’t bother with oxygen-carrying globulin proteins. There are exceptions- some larvae in oxygen deprived environments have proper haemoglobin but this is a badly explained term, not another blog topic. Intraspecific- Within a species. Interspecific would be between species. Like interstates are roads that travel between states. Intrastates would be roads that don’t cross state lines. Like a roundabout in the middle of Kentucky. I’m clearly an American. Parasitoid- Like a parasite but much much more dark and disturbing. an insect’s belly. The side-seam. Pronotal- Of the pronotum. Which is the first notum. (Which is the top part of the thorax. The thorax is divided into three sections). Substrate- Stuff on the ground. Dirt. Leaves. Gravel. Bark. Sand. And such. Ref 1. Two of the larvae joined the collection. Ref 2. This works for any insect that isn’t overly hairy or scaly but is bad for DNA. Gilgado, J. D., & Ortuño, V. M. (2012). 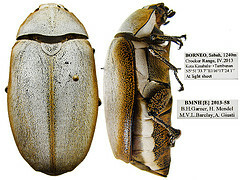 Carabus (Oreocarabus) guadarramus La Ferte-Senectere, 1847 (Coleoptera, Carabidae): first instar larva and reflections on its biology and chorology. Animal biodiversity and conservation, 35(1), 13-21. 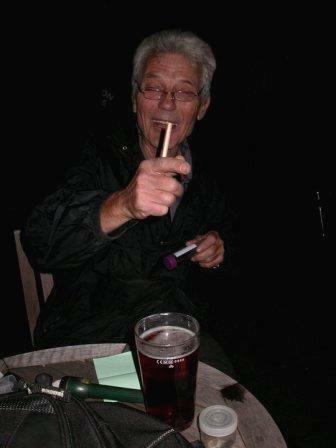 Gullan, P.J. & Cranston, P.S.. (2000) Insects: An Outline of Entomology, 2nd edition. Blackwell Science, 502 pp. Given we were heading to some really remote localities it was really important to inform local officials and indeed local people who we were and why this pair of crazy western 'researchers' had just appeared from nowhere. Here is our 4x4 vehicle with its very official notice! U Tafiti is 'research' in Swahili; 'wadudu' is insect! So we were entitled 'U Tafiti wawadudu'! Once we had set up camp after a five hour drive from the city of Arusha; it was time to um, relax! The beautiful Mount Hanang in the background. HT and some cows; overseeing unpacking proceedings! BG working hard whilst HT 'relaxes'! This is our 'science table' where all the processing of specimens: labelling, cleaning, filling up tubes with IMS happens. HT, our local guide Isaiah and Jembe our Masai guide all erecting a butterfly trap on the forest edge at Hanang. This will be elevated high up in to the canopy and baited with some delicious rotting fruit. Whilst HT was busy butterfly trapping I was off in another direction beating for beetles! BG, our camp expert Saleem and Jembe all looking for SBJs (small brown jobs, such as Phalacrids, Shining Flower Beetles) and weevils by beating vegetation with a big stick onto a big umbrella-like white sheet! Then it was into the forest edge to collect some leaf litter for sieving (again SBJs live in leaf litter, we are hoping to find things like fungus beetles (Lathridiidae) and Pselaphinae, and all manner of Cucujoidea)! As most creatures that live in leaf litter are small and secretive there is another very effective method we use to collect them by, which is known as the Winkler trap! Once we have sieved the litter to remove all the big stuff the remaining topsoil and litter is placed inside mesh bags within the cotton bag and basically hung up to dry. Eventually the small organisms will start moving about and head to the bottom of the trap where they fall into a waiting pot of IMS. Me with my Winkler! A very cold early morning at Mount Hanang! Sieving litter for Winkler traps at Hasama forest, Mbulu. It was soo cold and windy that the only way to do it was to seek refuge by the truck! We can't have a blog without mentioning poo it would seem so, onto dung trapping! We were very lucky at Mount Hanang to have the employ of a team of able and willing young entomologists who worked very hard searching for dung beetles (so we didnt have to!) and were amply rewarded with 500 Tanzania shillings and a packet of sweeties! Our 'snacky time' was around 5pm and the children soon learned that the office would be open once the hard fieldworkers had taken off their boots and had time for a G&T before supper (very civilised!). Here's HT 'negotiating' prices with the children. 'Snacky time' at Hasama Forest! Of course a freshly pressed newspaper was always made available! Driving a hard bargain! Our terms: one full tube (no padding with extra dung) and no repetition for 500 Shillings and a packet of jellies! Team dung beetle! (I'm the one on the left...). As our dung beetle workers would never reveal their sources, (very good business!) we did employ other methods. The classic dung pitfal trap where little pre-made knapsacks of dung (this time buffalo!) are suspended above pitfal traps work really well. These were placed every one hundred meters into and along the forest at Hanang. On to Longido, about 50 km from the Tanzanian / Kenyan border to a very different habitat: the bush! Very very dry and surrounded by Masai, goats and Acacia trees...we had to work very hard to find beetles here! 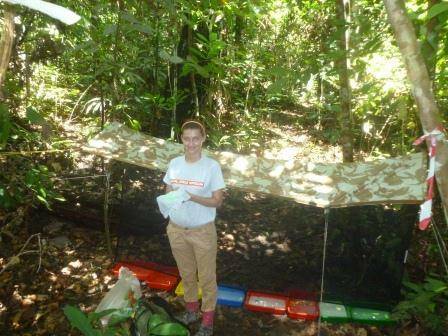 Longido bush setting traps: dung knapsack - tick! Soap-laced water for pitfall traps - tick! 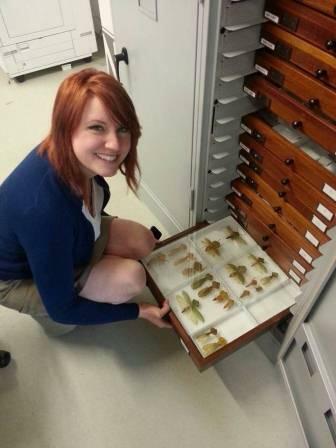 This entomologist is good to go! Yes, I am literally grubbing about in fresh buffalo dung; here I found some interesting Hydrophilid beetles especially adapted to living in poo! That takes us on nicely to collecting for water beetles. Whilst having a dreamy ride through the Eastern Rift mountains on our way to Mbulu, HT exclaims rather excitedly 'Stop the truck! Water!' I was less enthusiastic and stayed in the truck observing from a safe distance whilst HT sank up to his knees in a stagnant no doubt disease ridden puddle of water in the pursuit of water beetles and their ilk (Dytiscidae). And what better way to catch them than with a household sieve! NOT allowed back in the truck! Here we found not only some curious looking Dytiscids (predacious diving beetles) but also some whirligig beetles (Gyrinidae), leeches (yuk!) and a fresh water crab! Trapping using nets is the most common method but can often times be difficult in challenging terrain, not to mention remote environments where local people are overtly curious about what on earth you are up to! In Longido, where Masai children would appear as if by magic (We hold them entirely responsible for our missing pitfal traps!) we decided that the SLAM trap was too enticing for curious minds so we erected it as high up in the canopy as we could! This type of trap is very versatile as it can be erected anywhere but is especially good for wood piles where emerging beetles will fly into the net and become trapped. The entomologists demonstrate their good work! Malaise traps are more precise in where they should be placed. Ideally they should be in the way of an insect flight path so that insects fly into the net, instinctually fly upwards and just like the SLAM trap, become, um, trapped! 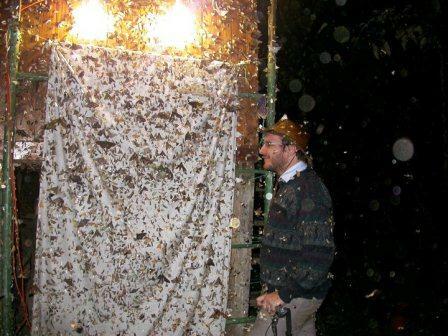 Finally to end on a 'lighter note' we must mention light trapping! Light trapping might be commonly employed for trapping butterflies and moths but it is actually very effective for catching beetles too. So, each night at dusk we would start up the generator and the mercury vapour light would work its magic! One night at the Longido camp an unexpected downpour somehow broke the light and so we lost a nights trapping; at Hasama forest the winds were so high that the light was smashed; another nights trapping lost. But, on a good night, it's possible to stay up for as long as you can, say until 3pm gradually picking off the insects that come to the light. At longido I found a prize Carabid, an Anthia, or more commonly known as a Domino beetle, that was more attracted to the sausage flies than the light! The downpour at Longido; luckily we had enough tarpaulins but failed to secure the storm flaps on one of the tens = wet sleeping bag! The entomologist (still apparently in her pyjama bottoms), demonstrates the light trap! And we leave you for now with a beautiful view! Next time the hardships and hiccups of fieldwork; and after that, fashion, fieldwork and friviolity...watch this space! 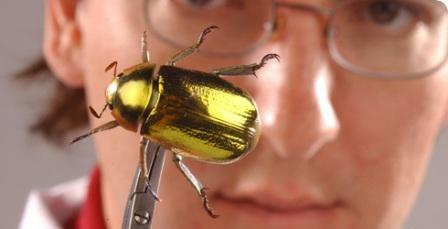 Science Uncovered - meet the beetles! 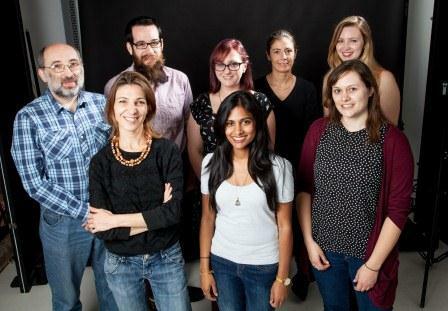 So, come Friday 23 September, it’ll be time for us dusty old curators to kick off our sensible sandals and get fashion forward for this year’s free Science Uncovered event. Science Uncovered 2010 was the first year that the Museum opened its doors to the public on such an unprecedented scale. We were expecting a few thousand; but after a few weeks of blogging, twittering and Face-booking over 6000 of you came to see the secrets of the Natural History Museum revealed – some for the first time. 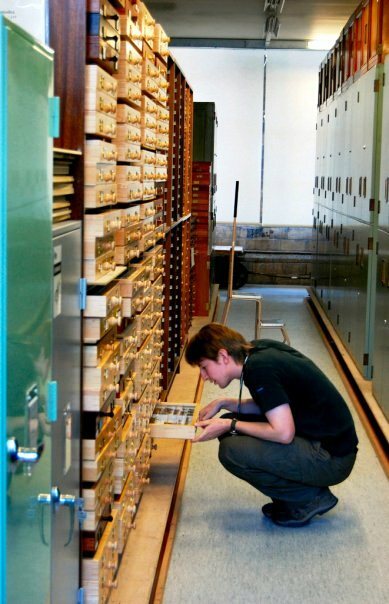 And not only our prized treasures of science, but our scientific staff, who, just like our specimens, don’t get out much! My experience last year was incredible, from 5pm to 10pm my colleagues and I did not stop talking – to you! It was simply amazing, invigorating and yes, exhausting to have the opportunity to engage on such a wide scale, and also on such an intimate scale with hundreds of conversations about the Museum, our specimens, and most pertinently our research. 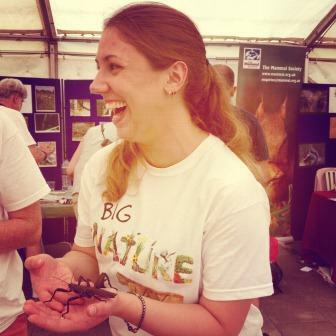 Last year I spent my time on the Identification and Advisory Service’s ‘Identification Roadshow’ where we invited you to bring along your natural history finds for on the spot identification. 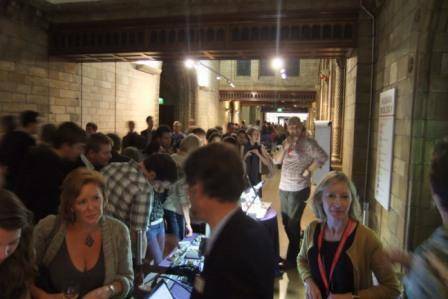 Here I am, looking a little bit overwhelmed, along with Stuart Hine, Richard Lane and Gill Stevens in the foreground, along Dino-way, where this year you will find the entomology station. 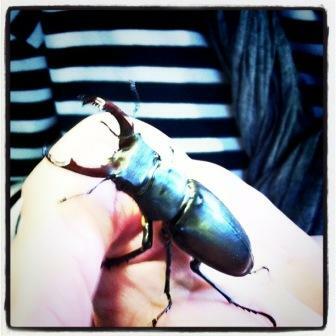 But this year I move over to my first love, the beetles! Here’s one I found in Southeast London this summer, you may recognise it? And it may make an appearance on the night! We will also show you some of the most beautiful creatures in the world, for example this wonderful Plusiotis, a member of the shining leaf-chafer beetle sub-family. 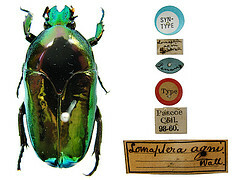 Chrysina aurigans (Rothschild & Jordan, 1894): collected by Martin Brendell in the cloud forests of Costa Rica. Here is Max Barclay, who will be available on the night at our entomology fieldwork Science Station armed with field equipment and some examples of what we find when we head off to research remote areas throughout the world. Other colleagues include Hillery Warner, who is expert in photographing our specimens; see some of her work on Flickr here. 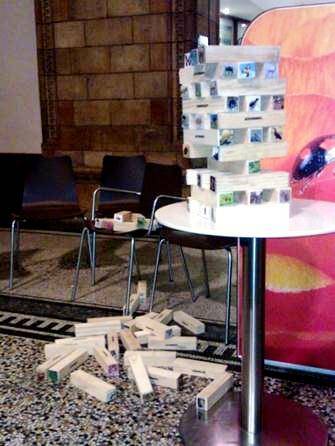 Science Uncovered is a free event on Friday 23 September 2011 at the Natural History Museum. 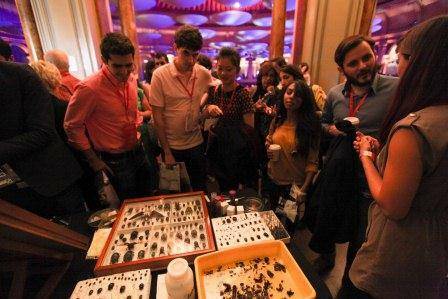 All events and tours at Science Uncovered will be free but, due to time and space constraints, some will require you to book free tickets in advance. To find out more visit Science Uncovered on the Museum’s website. The Natural History Museum at Tring, Hertfordshire, will also be holding its own Science Uncovered event. Find out more about Science Uncovered in Tring. To get involved before the night, visit our Science Uncovered online community where you can get previews of what’s happening and join in with discussions and debates.